The calculation of state shares includes the shares (volumes) that each state holds in MDBA storage at the end of the month. The calculation includes volume stored and the remaining 'airspace' or volume left in storage for each state. This plot is updated on the first working day after the 15th of each month. We are responsible for sharing the waters of the River Murray system between the states, as part of the Murray–Darling Basin Agreement. To achieve this, we must first track or 'account' for the water in the River Murray system taking into account volumes currently held in storage along with previous inflows, diversions and system losses. We apply the water sharing rules of the Agreement to determine state ownership of this water. We then calculate what inflows we can rely on for the remainder of the water year and any water that must be set aside to meet reserves and future system requirements. The remaining water is then shared between New South Wales (NSW), Victoria and South Australia in accordance with the rules of the Agreement. We also direct system operations to physically deliver and manage the flows of water. To find out more, see running the River Murray. The MDBA reserves, transmission and evaporation losses are not included in the water made available to the states. The calculation of state shares of water include the shares (volumes) that each state holds in major storages at the end of the month. The calculation includes volume stored and the remaining 'airspace' or volume left in storage for each state. This data is updated on the first working day after the 15th of each month. See the state share storage reports at the top of this page for more information. 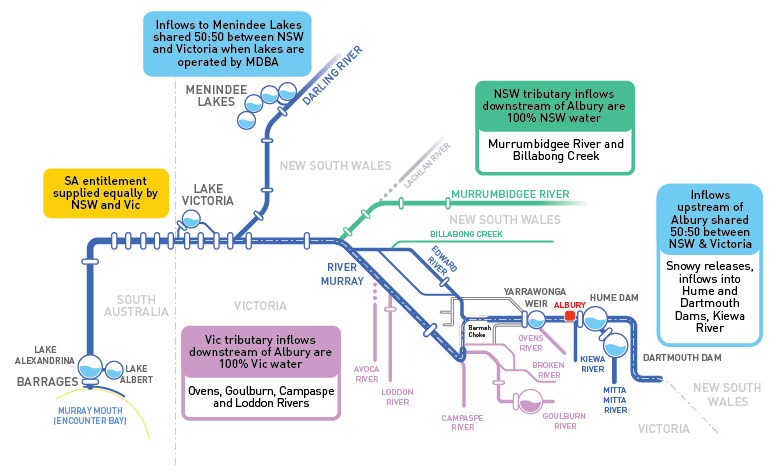 The general principle of water sharing for the River Murray system is that New South Wales and Victoria each receive 50% of the flow upstream of Albury (ie. inflows to Hume, Dartmouth and from the Kiewa River) and 50% of inflows to Menindee Lakes. From state shares held in storage and tributary inflows assigned to each state of origin, New South Wales and Victoria provide South Australia with its entitlement, which varies from month to month as stipulated in the Murray–Darling Basin Agreement. In 2011, approval was given for South Australia to store its share of water resources for the purposes of meeting its critical human water needs and private carryover in major storages. When sharing the storages in the River Murray system, states must acknowledge the principal that the volume of water held in storage must not exceed half of the capacity of the reservoir in which it is stored, otherwise it is deemed to have been 'spilt' within the reservoir to the other state (ie. spilt water is added to one state's storage account and deducted from the 'spilling' state's account). Further water accounting principles and rules are detailed in the Murray–Darling Basin Agreement.